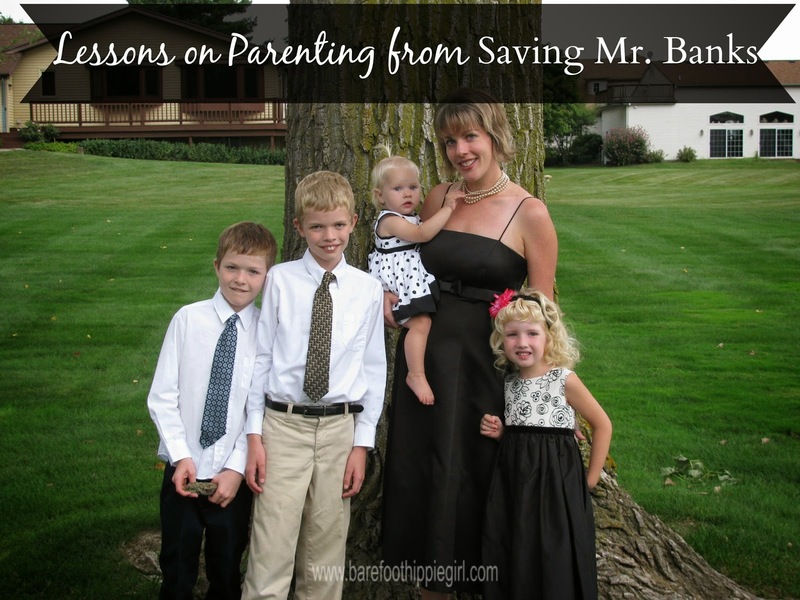 We watched Saving Mr. Banks last Sunday. Saving Mr. Banks made me cry. Not loud and raucous sobs, just rivulets of tears running down my cheeks. It's empathy (or hormones, or both). I felt the characters' pain. It was a reminder that we all go through stages in our relationships with our parents. There is the worshipful love of our preteen years. Our moms are the most beautiful women in the whole wide world. Our dads are our heroes. Then there is the angst filled teen years where the relationship is often rather strained. Rebellion against rules and boundaries, with all those hormones and such, makes it a rather rough go. But, then, at some point in time, we become parents. And we start to realize that this parenting gig is not for the faint of heart. It is hard work. It is a 24/7 responsibility that never stops once it has begun. And we start to feel a twinge of empathy for our parents. We begin to realize that they were just trying to parent in the best way they knew how. They were trying to raise normal, productive human beings. If they were Christians, they were trying to impart a knowledge of and relationship with God. They were trying as parents to follow God's will. To do justly. Love mercy. Walk humbly. But, they often failed. They made mistakes because they are human. We begin to see our own mistakes, and we start to understand of the scope of this task and call. We empathize. We forgive our parents, and we extend grace and the benefit of the doubt..
We hope our own kids will turn out somewhat normal, without the need for too much therapy. We hope and pray that our kids will extend grace and forgiveness to us. That they will realize that we were just trying to do our best in this really hard but awesome task that we had been entrusted with. I hope my kids will remember the laugher at corny jokes, and all the books we read together. I hope they remember our devotional times, and our times of playing. I hope they remember our vacations and the every day bits. I hope they remember that I prayed with them and taught them to pray. I pray they will graciously forgive and forget the uglier parts. Impatience and anger, busyness and to-do's. So, when did I start crying in the movie? When Walt is having a heart to heart talk with Pamela Travers. He said something along the lines of the fact that they are storytellers. They give hope. They can change the ending of the story. That's the other part of this parenting gig. By the grace of God, I don't have to keep making the same mistakes either. Mistakes are inevitable, of course, but I can have victory over sinful behaviors in my parenting. I can start a fresh page today, and move forward-a bit differently. I can forgive myself too. I can extend grace to myself.